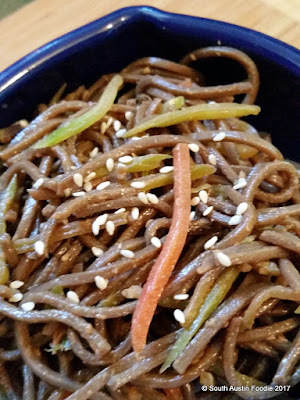 Here's an easy soba noodle recipe that my friends enjoyed. While I haven't run an actual nutritional profile on it, it's pretty dang healthy, and you could add some protein too. Cook slaw to package, either via microwave (about 3 minutes) or blanching (about 2 minutes); drain and rinse under cold water. 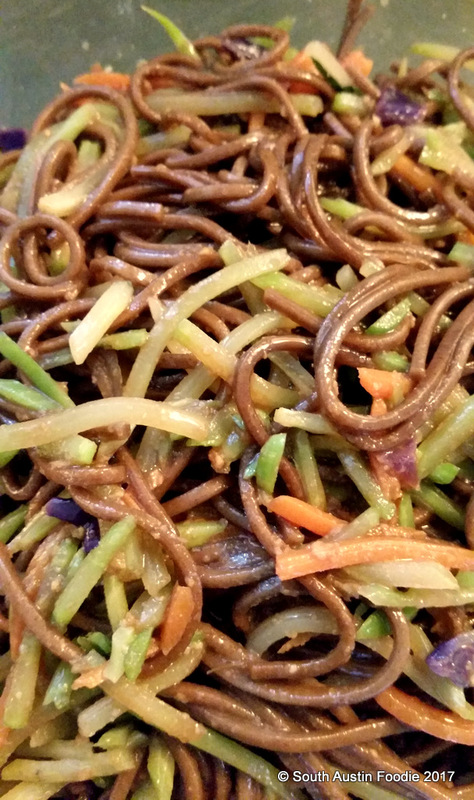 While noodles cook, prepare the sauce; in a small food processor add remaining ingredients and combine. Taste it! Add more of something if you wish! Toss sauce over noodle and combine well. Let refrigerate for at least an hour. Add protein of choice if desired (grilled chicken, baked or fried tofu, etc. Like many dishes, it tastes better a few hours after it's been assembled. Also great for picnics/outdoor events because there's no mayo/eggs. 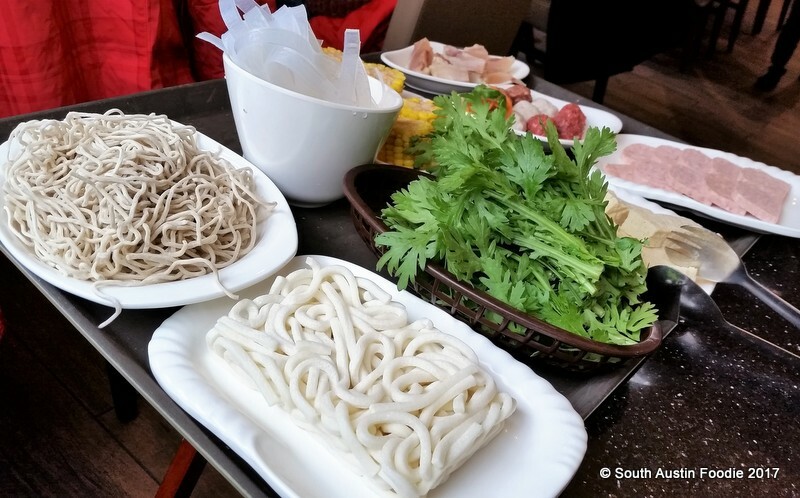 Food Fun at Little Sheep Mongolian Hot Pot! 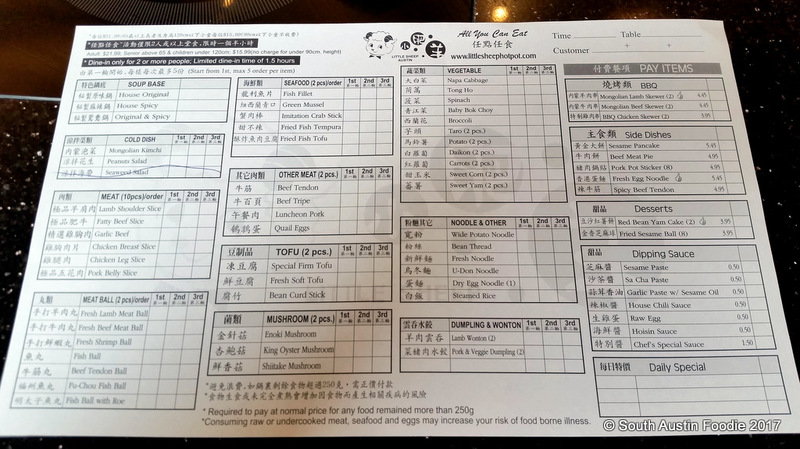 I don't eat at many chain restaurants, much less write about them, but three of us had so much fun recently at Little Sheep Mongolian Hot Pot that I feel it warrants a blog mention! 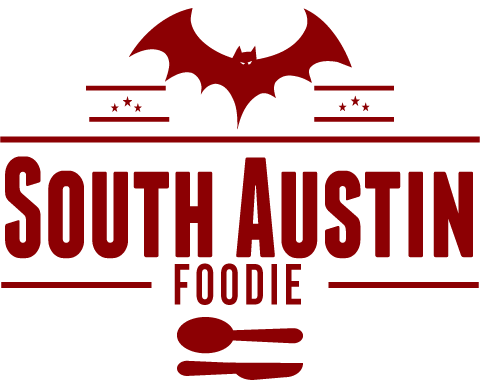 Located at 24th and Seton, they are three blocks west of Guadalupe near the UT campus; a small parking lot is available and they are open seven days a week for lunch and dinner. 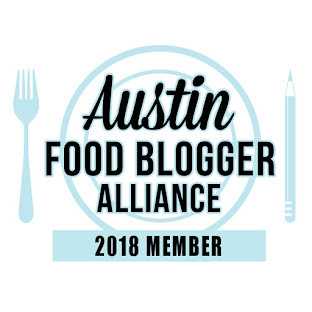 Warm soup was just the thing we needed on a recent (rare) blustery winter day here in the ATX. I should have taken more photos of the set up, but I didn't so you'll just have to trust me. Each table is has it's own built-in hot plate. And this is designed to be communal food. If you don't like sharing your food or eating family style, this may not be your thing. You do have your own individual bowls to portion your items into, but my friends and I are comfortable enough with each other that we just picked things out of the hot pot with our individual chopsticks (read: double dipping) half the time. First you have to decide if you're going to order a la carte or just do the all you can eat price of $21.99. We decided to do a la carte and ultimately may have been a bit over-zealous in our ordering, because the total came out to exactly $21 each before tip. No regrets though! They have these handy menus where you just check off the items you want. Then you need to decide on a soup base (original or spicy), or they have these nice ying yang pots so you can try both! 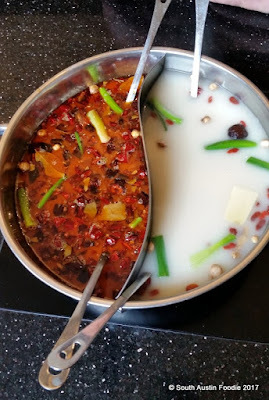 We were also impressed by the ladles as they have a hook on the backside that latches over the sides of the pot so it doesn't get lost in the broth. Genius! 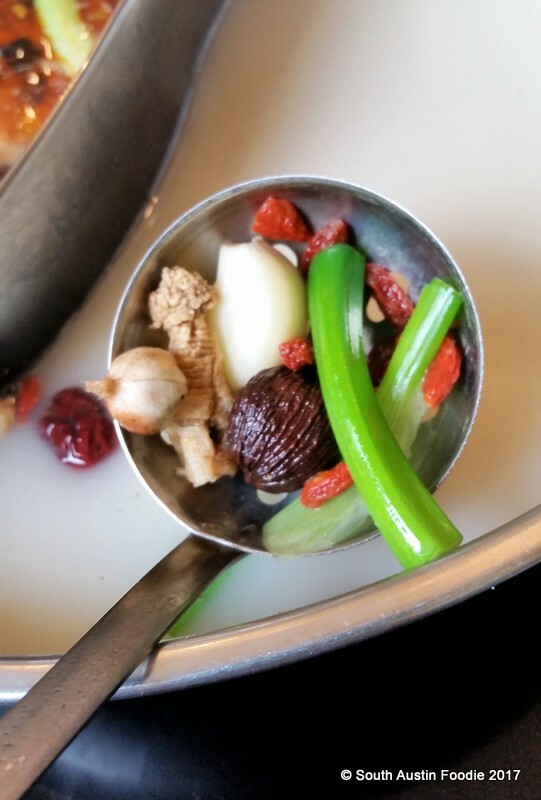 And upon closer inspection of the broth, it was chock full of all kinds of things, like longan nuts, goji berries, black cardamom pods, and of course chiles in the spicy one. According to their website, the broths are made from the colonel's secret recipe of more than thirty ingredients. For meats, we went with the lamb shoulder (pictured in the back) which was my favorite, and the pork belly. They slice the meat while frozen to get these paper thin slices which cook in a flash when you dip them in the simmering broth. And being the hearty eaters that we are, we went for THREE kinds of noodles! In the white bowl are the Korean-style sweet potato noodles, as well as fresh noodles and the thicker Japanese-style udon in front. The leafy greens are called tong ho, and they have a really nice taste to them, but it's not one I could really verbalize. We looked it up and discovered it's chrysanthemum! Other items include tofu, luncheon pork (aka Spam), beef tendon, and a trio of meatballs (beef, fish, and lamb), and sweet corn on the cob which proved to be a bit difficult to eat once immersed in very hot broth. Everything was very fresh and came out beautifully presented, particularly the sliced meats. 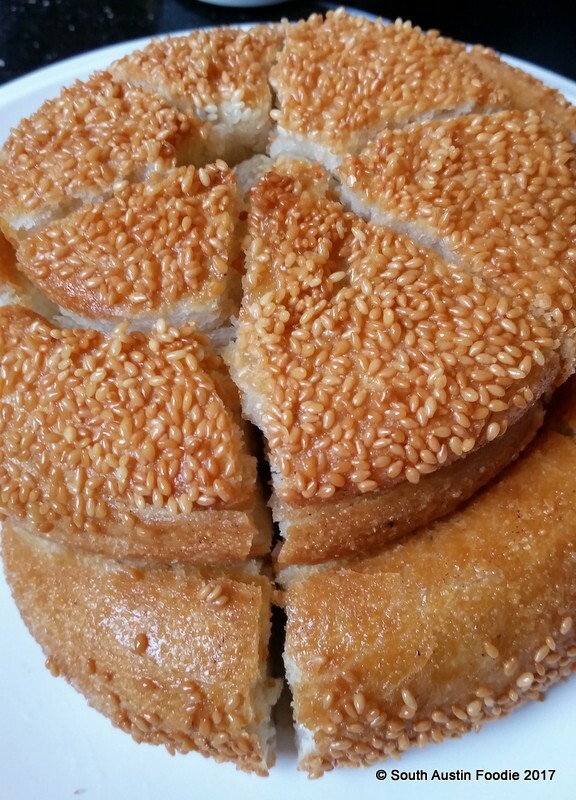 Then there's this loaf of bread that's called a sesame pancake. I got excited seeing it on the menu, because I thought it might be like the thin, flaky green onion pancakes that I adore. Clearly this wasn't that. The crispy parts on top with the seeds were delicious, and the fairly dense, bready, yeasty insides were plain, but good for sopping up the broth and saucy bits. But at 4 - 5 inches tall and about 8 inches wide, I'd hardly call this a pancake! Apart from just having a great meal with friends and bonding over a shared love of food, what's so fun about a hot pot meal like this are the options. There's tons of them! 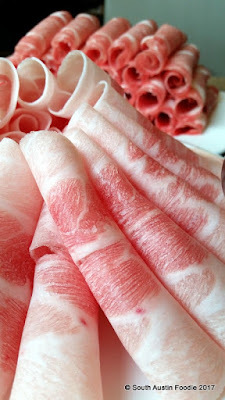 And if you're not a huge fan of beef tendon like me, then you just avoid it and let the others enjoy it or get over there and try new things. It's just a fun way to share a meal, call it breaking bread or slurping soup together, it all brings us a little closer. Food and friends, what more do you need?